Here comes more photos of nothing else but glorious food! 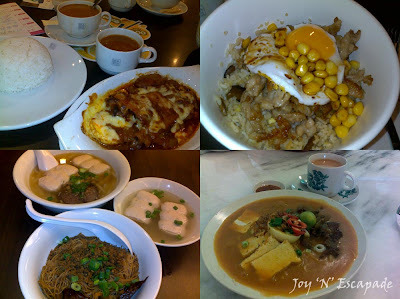 Top left, clockwise: Six Mark Curry with Rice plus Shredded Chicken, Mushroom & Corn with Rice from Kim Gary, Mee Jawa with Squid from Boulevard Kopitiam (beside Sterling Condo, Kelana Jaya), and Homemade Porkball Noodles (Dry & Soup) from 3JC Restaurant (One Utama). 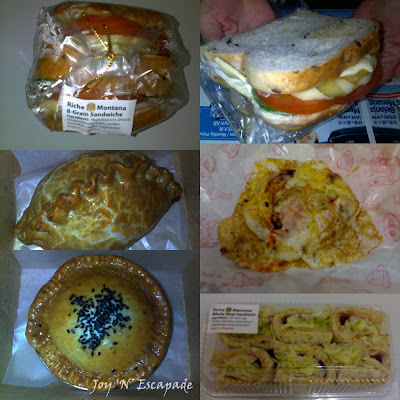 Top left, clockwise: 8-Grain Sandwich from Riche Montana (Sri Kembangan), homemade burger without bread, the meat is wrapped with egg, Wholemeal Sandwich from Riche Montana (Sri Kembangan), Black Pepper Lamb Pie & Chicken Cornish Pie from Secret Recipe.